A public land, free ranging New Zealand tahr hunting adventure. You don't have to spend big dollars to have a great hunt in New Zealand. Well I am back home after an awesome time on my New Zealand tahr hunting adventure. Certainly Tahr hunting is one of the toughest things you will ever do, but there is something about it that draws you in, and one thing is for sure; you will go back and do it again, as I will. I chose to hunt public land (Department of Conservation or DoC) with this outfitter as this is a much cheaper option than a private land hunt, albeit the tougher option. With our camp and hunting gear organized, we headed up into the first side valley to look for Tahr. At our first glassing point, my guide had his Leica binos to his eyes for approximately two minutes when he says “There’s one….two.” He had to point them out for me, these animals are seriously hard to spot and it took me a day or two until I was finding them for myself. Anyhow, we found two nannies and a young bull about a kilometer away atop a bluff so we moved on further up the gully for a look. Near the head of the gully we spotted about five bulls spread down a ridge, but with the day getting on we opted to leave them for the morning. It is seriously hard to judge distance up here, a couple of animals I judged as 4-500 yards were off the scale through my guides Leica rangefinder binos. That means they were 1300 + yards away!! I had never used a rangefinder before but it is essential kit up here IMO. We had around a kilometer to climb up to these particular Tahr. Not too bad I thought…until he says, “this will be the slowest kilometer you’ve ever done.” How right he was. Two solid hours of climbing later we sat amongst the bluffs at 1800m altitude, and what a view looking down…you can just see the valley floor in the distance. Climbing through the rocks and snow is seriously energy-sapping, you need to be constantly aware of where you place every foot and in most areas you have to kick a good toe-hold in the ice before taking another step. From here it became some serious rock climbing through the bluffs, expecting to see animals at any time. As Simon stuck his head over a couple of boulders he saw the animals and motioned to me to climb up. I got up and kicked a couple of good footholds, then lowered the bipod. A nanny and two young bulls were standing together on the next bluff. Simon ranged them at 190 yards and judged them as young 9 inch bulls. They were only young bulls but after a long tough climb I decided to take the best of the two, I didn’t want to pass something up early as there may not be another chance. I put the cross hairs low into his shoulder and squeezed, the .30/06 almost surprised me as it went off and the bull was blown clean off the other side of the bluff. Shooting an animal up here is only half of the story, then you have to get to it. we had to drop down below the bluffs, sidle across a heap of knee-deep snow and then climb up an avalanche chute where we finally found my bull. Only young, but a bull Tahr all the same and we were on the board. After hunting up here, I reckon that any Tahr taken fair-chase, on public land, on foot without a helicopter is truly a trophy earned. I was stoked with my first bull and he is currently becoming a shield-mount. For two night we shared the hut with two guys from Invercargill, it was great to meet a couple more Kiwi hunters and although Stan and Glen hunted hard they went home empty handed, leaving us to hunt on. The only other people seen during our four-day stay were a couple of extreme skiers who were trekking in to a Glacier Lake. Nutbags…. On the last afternoon of my hunt we located three mature bulls atop a bluff. We climbed a rocky ridge opposite and settled in for a long wait. What an awesome sight, seeing the wind blowing through the manes of these big bulls as they cling to the smallest ledges. Simon judged them to be good bulls in the 11-inch class. We sat amongst those rocks for three solid hours until light began to fade. Eventually one bull got hungry enough and took a few steps down to the left. Simon asked if I could still see them through the scope. I sure could! “410 yards, it’s now or never”, he replied. I had never made a shot at that distance before but knew my .30/06 hits 6 inches low at 300 meters, so I held a few inches above the bull’s thick mane and fired. “He’s hit!” Simon yelled. I looked up in disbelief as the bull tumbled downwards. In a narrow chute the bull found his feet again. “Hit him again”, Simon said, “325 yards.” I held dead-on and hit the bull, he tumbled downwards again and the excitement was electric after such a long wait. However, disbelief set in again as the bull came to rest on a tiny ledge above a waterfall, stone dead. Sadly, there was no way to get to him. After a restless night back at camp, we headed back first thing in the morning before we headed home, in the hope that the bull had fallen down; but alas he was still up there. I put a couple more shots into him to try and dislodge him, but nothing worked. Simon thought long and hard about every possible way of getting to the bull, but an animal is not worth someone’s life so my trophy is still sitting on a ledge, halfway up a bluff in New Zealand. We left detailed directions with Simon’s phone number in the hut book, the bull is located in a waterfall path so Simon is sure he will wash down in the next big rains. He only had to fall a foot in any direction and he would have landed on a large shingle slide and slid right down to the creek bed! Hopefully if an honest hunter finds him I may get my trophy back someday. All-in-all this hunt was an awesome experience that I will definitely repeat. Anyone thinking of hunting New Zealand, just go and do it, as I have proved you don’t have to spend big dollars. The terrain and hunting is so vastly different to our country in Australia that just being there is an experience in itself. 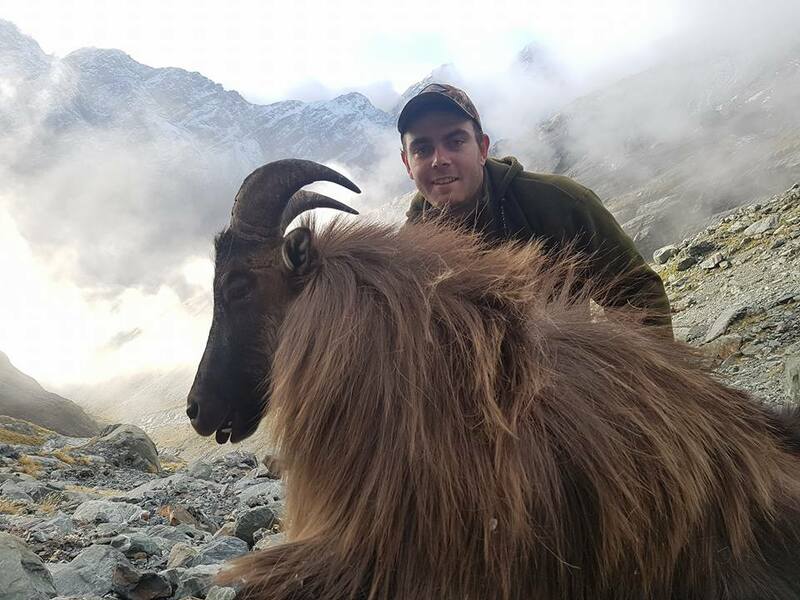 I can’t recommend this New Zealand tahr hunting adventure highly enough, and anyone wanting to hunt NZ would not go wrong hunting with this outfitter, he is a straight-up bloke who hunts at your pace and really knows and loves his Tahr hunting.